Hello, my name is Margaret Pratt. My husband was murdered in January 2014 on our boat in St Lucia. As you’ll know, I've spent the past almost four years trying to get justice for Roger. At long last it looks as though we are starting to make a bit of progress in the court hearing. On 24th October the court met and the judge has asked for the defendants to be brought back into court on 8th November, when they will be invited to make a plea as to their involvement in Roger’s murder. 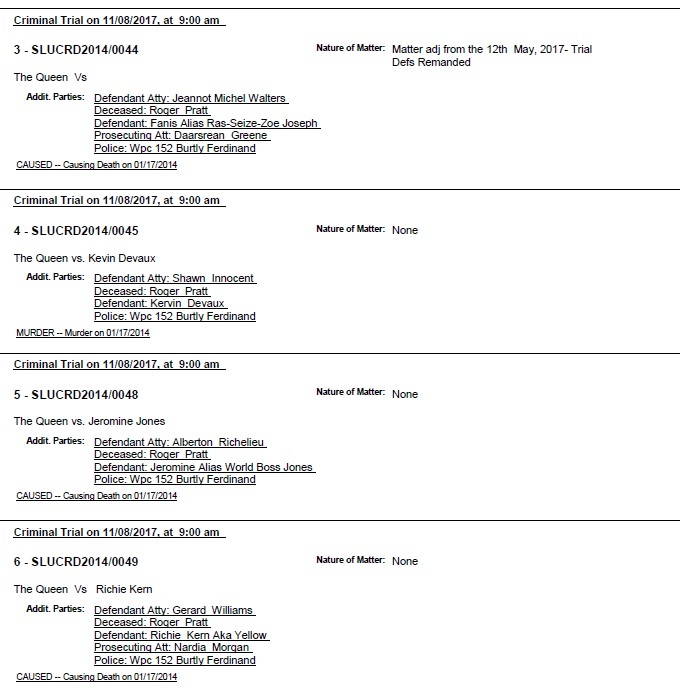 The High Court's 'Cause List' for next week show that four people will attend court at 9am on 8th November: Fanis Joseph, Jeromine Jones, Richie Kern and Kervin Devaux. It's almost four years since Roger was murdered and there are four young men who've been in prison on remand for the whole of that time. It's taking a long while to get to this stage so I'm really looking forward for this element of completion of this case, not just for me but also for the justice system in St Lucia and for the four young men concerned. The defendants will have the opportunity to put their side formally in court, if that's what they wish to do, and we do finally appear to be making some progress towards getting justice for Roger. One of the things the past four years has taught me is that it's a mistake to build your hopes up too quickly. I won't be satisfied until the court cases are completed and the sentences, if there are sentences, have been laid down. I am today feeling much more optimistic that there is a process, that there is a journey and at the end of that process there will be fairness for everybody.